It was really lovely being back in Hong Kong last week, after a few years away. The talk we Lorenzo Cifonelli and I did at Attire House worked well - more a conversation than an interview, with Lorenzo asking me questions about other tailors, and the audience chipping in with style questions. It was nice to see new places like Prologue, and to catch up with the likes of Alan, Mark and Kenji. We see each other at Pitti of course, and occasionally in London, but it’s never quite the same as going out to dinner in someone’s hometown. And I had a little time with Arnold, now working at Attire House, to shoot some pictures on the first morning. This is a very relaxed outfit for a hot, humid day. Hopsack jacket, with lining only across the top of the back - double-breasted and made by Elia Caliendo from Naples. This remains one of my most versatile pieces, and pretty much always comes on hot weather trips. It’s smart enough to be worn with a shirt and tie, high-twist wool trousers and oxfords. Or, as here, with a denim shirt, no tie, and slip-ons. Trousers in a khaki-coloured 11oz Irish linen - made by Whitcomb & Shaftesbury. Even though it’s heavier, I would always have trousers in the slightly heavier Irish linen. And the khaki colour feels a little more casual than most linens, almost a vintage US Army colour. An old denim shirt from Al Bazar, which isn’t fitted enough in the waist, or long enough really, but has been worn so much over the years that I love the way it’s falling apart at the collar and cuffs. The collar also seems, somehow, to stay perfectly upright without a tie, alone among all the RTW spread collars I’ve ever tried. And on the feet, that hot-weather staple, Sagans from Baudoin & Lange. I now have dark-brown, oak-brown and the bark-grey I picked for the collection. Sagans aren’t quite suited to walking around all day, given their relative lack of support, but that’s outweighed by the coolness and comfort. And I spend so much time sitting down anyway. 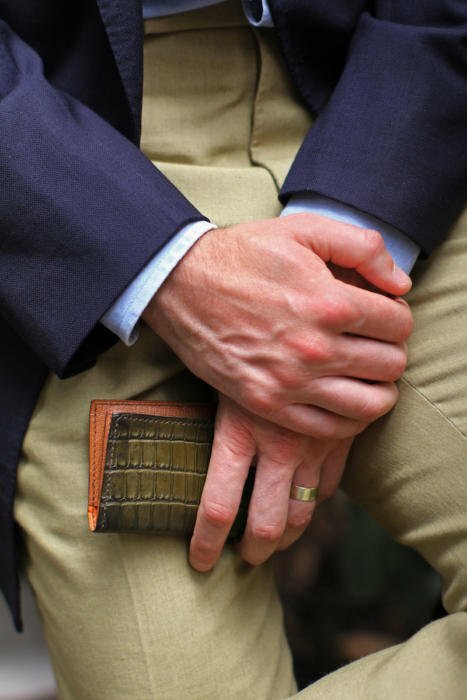 The wallet is from Serge Amoruso - a beautiful green alligator with orange calf lining. I didn’t like the contrast in leathers at first, but am growing to love it. The green has also started to get a nice little patina around the edges. 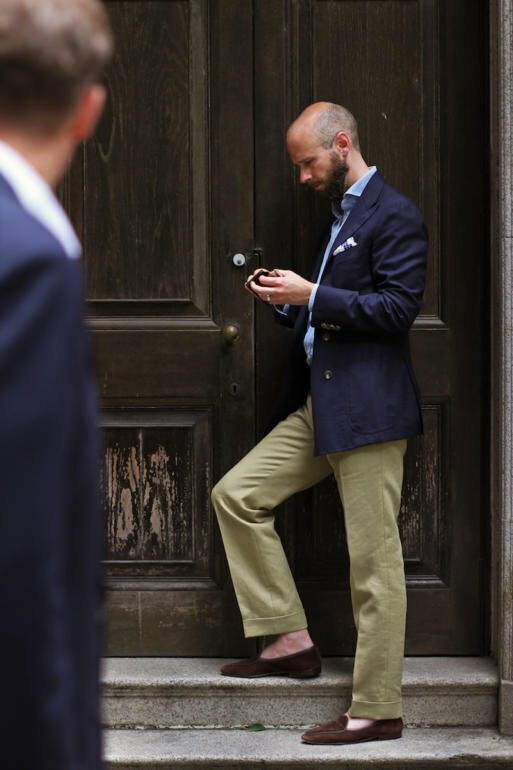 You can follow the discussion on Hopsack and linen trousers – in humid Hong Kong by entering your email address in the box below. You will then receive an email every time a new comment is added. These will also contain a link to a page where you can stop the alerts, and remove all of your related data from the site. Lovely outfit. Although the trousers look very baggy and straight legged? In terms of the fabric, given the weight, do they hold their shape well? Also, after how many wears do you get them dry cleaned? It’s linen, not too much you can do about that, although it’s still better than lightweight European linens. It’s also a relatively straight, classic cut. Simon where is your socks? You must not be in a city place and not have them! Even with the strong humid you must do. Linen or bamboo is best fabrics for this. No socks on is good in Cannes or Monaco, but bad in Paris or Hong Kong. Would you usually press at home or ask your local dryclean for a steam and press? Thanks for the reply. I’ve come across a 13oz linen. Do you think this would be too heavy for a pair of trousers? Also, for separate linen trousers, which colour do you think would be the most versatile? Do you think it would wear too warm? My alternative is Crispaire. Probably worth noting that you likely press them much more often than this? Do you use a trouser press? Buggy lining is quite a job on a DB. Hope they taped the seams nicely. Like the trouser. On the subject of summer jackets, I’ve been looking at the Harrisons Mersolair patterned linens at 340g. Would this weight of linen be too heavy for summer despite the supposed coolness of the fabric? No lining in the arms for the hopsack jacket? As to the trousers, isn’t there a pair made of wool that could have been as suitable as this one? Mind you, I love linen – and in this color – too! A really versatile ensemble Simon! Interesting that shirt, jacket and trousers all have their own particular texture but harmonise so well together. Were you wearing these trousers when my wife and I chatted to you at Napoli airport yesterday?! Hope you have a successful trip and look forward to reading all about it. Best wishes. Thanks. No, different trousers, but nice to meet you! What kind of shoes would you recommend for hot weather when you need to walk a lot and look smart, business casual? Simon,do you think that the trousers look a little loose around the ankle because you are wearing Sagans which normally look a little smaller than your average Oxford shoe?I think when wearing pants with Sagans,espadrilles, mocs …you should have the bottoms about 15″ or less …it lends itself to a sleeker look and harmonizes more with smaller footwear. Fantastic warm weather look. I read your pieces on W+S and may try them out next time they are in LA for a fresco suit and some odd trousers (having commissioned pieces from both Thom Sweeney and Edward Sexton, I am looking for better value for basic business pieces). The odd trousers look great, do you know the approximate rise you go with on W+S pants? Simon, I appreciate the effort you put into this blog. I’m curious if, with versatility and timelessness being of most import, you would recommend a double breasted or single breasted navy hopsack as my first summer sport coat. How did you transport the jacket, and did you have it pressed upon landing? It’s interesting you bring up the imperfections of RTW shirts. I want to buy RTW shirts, but have found the sleeves a little long. Is this an easy alteration to do? Glad to hear! I’m going to shorten them only by 1.2cm, in which case doing it from the cuffs seems to work fine. If I were to buy a shirt with a hand-attached sleeve, wouldn’t shorten it from the top risk ruining the handwork, assuming most alteration tailors do things with machines? I’m interested that you opted for a denim shirt in warm weather. Do you not find demin too hot in such situation? How heavy is it compared to your Eeryday Denim? Is that the former French Mission building? The trousers look fantastic! What some commenters refer to as baggy I find to be very pleasent, not too loose nor overly contemporary slim, especially with the high rise. I suspect the width at the hem is a tad wider than your usual width? Might I ask how much the wallet cost? And how does the quality compare to one from equus for example? Very similar in make, perhaps a little finer in places, and definitely a more French aesthetic. Let me confirm the current price. My favourite outfit on PS for 2018. Very nice Simon! Apologies if you’ve detailed elsewhere but what is the trouser cloth maker and reference? Good colour combination but personally I would never go for a DB in a summer jacket for two reasons. Firstly, if you do it up defacto you have a double wrap on it risks to be too warm. A DB should always be fastened unless seated. They look terrible open. Lastly I think these shoes are definitely ‘resort’ only and socks should be de rigour in cities. But surely that’s the whole point of a linen suit, i.e. to be worn in hot weather? So a 14oz linen suit a bit pointless then? Simon – do you often wear a DB open? I’d always thought it a bit of rule not to unless seated. Obviously rules can be broken but I’ve always found an open DB to present odd lines. Yes, the general rule is that a DB should always be closed – if you want to be very traditional, even when seated. I also agree that a DB will not look very good if just left open as you walk along. However, it can look quite stylish if you have your hands in your pockets and therefore push one side of the jacket back. Or have your hands in the jacket pockets even. Of the jacket or the trousers? To be honest, both are old so it’s unlikely to same ones will be available any more. 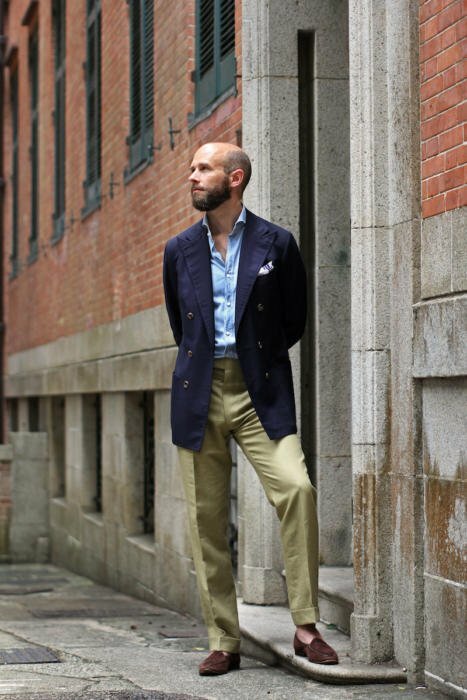 But I’d look to Holland & Sherry for a navy hopsack or mesh, and W Bill or Harrisons for an 11oz linen for the trousers.